Moscow’s Sokolniki Park features the world’s only year-round Ice Sculpture Museum, where the temperature is kept at -10 C (14 F) degrees. There is a common stereotype among foreigners that Russia is a very cold country, where everything is covered in ice and snow, and in winter you have to wear special felt boots known as valenki to avoid frostbitten feet. In Moscow, however, your feet are more likely to sink in slush than in snow, and catching a glimpse of a true winter fairytale is a challenge even for locals, to say nothing of tourists. But just over a year ago, a new place opened in Moscow that gives its guests a good idea of what frosty weather really is, regardless of the season. It is the Ice Sculpture Museum in Sokolniki Park where the temperature indoors is kept at -10 C (14 F) degrees throughout the year. Enthusiasts of frost and ice art flock there, especially on weekends and holidays. It’s not uncommon on those days to stand in line for an hour to buy a $10 ticket. After buying a ticket, the next stop for visitors is the cloak room – but even here the process is unusual. Instead of leaving their coats on hangers, people take long quilted coats known as vatniks and put them on over their clothes, and it is also possible here to exchange city boots for the rustic valenki. In winter, the indoor temperature may be higher than outdoors, but in summer you won’t last long in the museum without special attire. The idea to create such a museum came from the creative group Art Bliz, specifically Pavel Melnikov and Bagdad Stepanyan. Melnikov is a five-time winner of the world sand sculpture championship, and Stepanyan is a three-time world champion in ice and snow sculpting. For many years, their team has taken part in sand sculpting charity events in Venice devoting sculptures to the Beslan tragedy, Pope John Paul II, Mahatma Gandhi and Mother Teresa. Melnikov and Stepanyan’s ice museum project also has an international element. Sculptures have been created by artists from Hungary, Bulgaria, the Netherlands and Czech Republic. Russia is represented in the museum by ice sculptors from Moscow, St. Petersburg and Archangelsk. In addition to supplying a number of sculptors, Archangelsk has also provided a substantial portion of the ice. The curators need just one glance at an ice block to see which has been imported from the north, and which has been cut from a river outside of Moscow, where the fast current makes an imprint on the structure of the ice. Some 800 tons of ice and 200 tons of snow were used to create the sculptures covering the 500 square meters of exhibition space. The organizers christened the exhibit “Ice Universe” and did not restrict the creativity of the participants in any way. 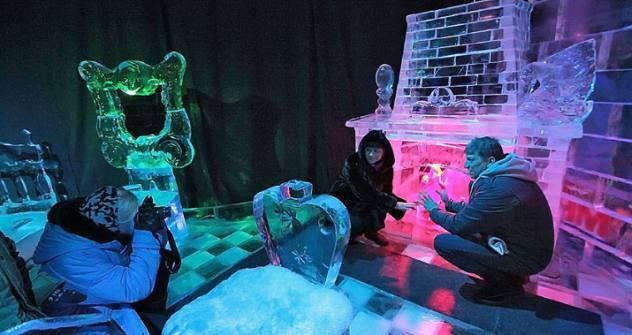 The result is an exhibition of ice ranging from a Pegasus and space cartoon characters to a Chukchi tent and Christmas manger, a dinosaur skeleton and a living room with a fireplace to real frozen flowers and giant ice insects. The museum also offers master classes for those interested in creating, not just observing. It takes just half an hour, an electric saw and a chisel to cut out an ice fish. Of course budding ice artists can’t take their work home, but they are left with some wonderful memories.